We had scheduled a 5 day trek through the Andes mountains around the Antisana and Cotapaxi mountains (2 of the highest mountains in Ecuador). We only did 4 days because bad weather took away one of the trek's intended major benefits -- great views. 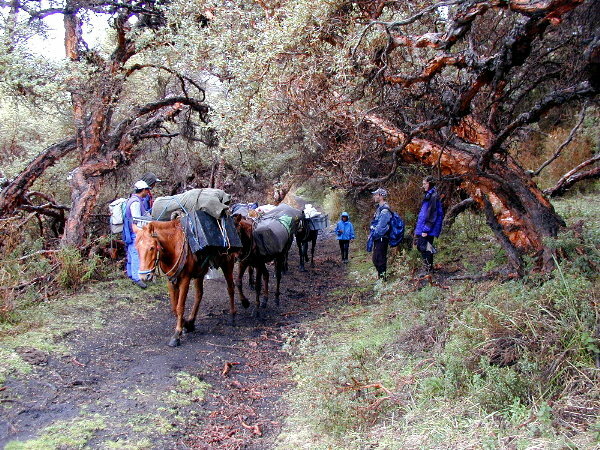 We had no idea the trek would entail an additional 6 people and 5 horses -- 2 guides, 3 horse keepers, 5 horses to carry food/equipment, and a cook! We got lots of exercise, but paid for it with cold hard nights. We were looking forward to amazing views and good exercise on this trek. We realized when the picked us up at the hotel with a very old Land Cruiser stocked full (top and back) with supplies, that it would be different than what we expected (not to say bad, just different). We stopped and got knee-high rain/mud boots at the agency office. Another sign of what was to come. Our guide explained that they had to change the first two days of the itinerary because a land owner refused to give them permits to cross their land. So, we would be trying this new way that the guides had never tried before. Another sign . . .
We drove about an hour to the 'horse keeper's' farm to pick up the horses. We had thought that we would have porters carry a limited amount of supplies for the trip. But instead it took 5 horses to carry the vast amount of supplies for this trip. They brought a full butane tank, cooking arrangement, eating table, and enough regular food to feed an army! They had full containers of ketchup, peanut butter, 16 boxes of tea, 8 loaves of bread, etc. We justified not feeling bad about needing 5 horses, since we were only 2 people and we had not asked for or expected 6 support people! Before we left the horse keeper's house, his wife invited us into their kitchen (very small) and made us rolls, fresh warm milk and cheese -- the milk and cheese were both produced on their farm. They were very good! 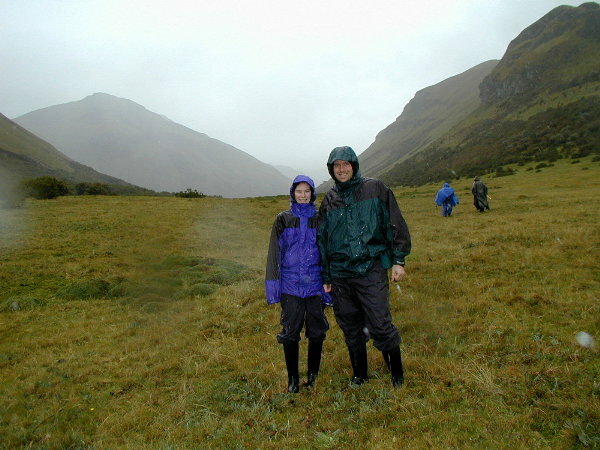 It was raining when we started the trek, but we realized that we were prepared clothing-wise for that type of weather. Our careful jacket shopping was paying off! It continued to rain off and on for that entire day with a brisk wind and 38°F. But this was our hike and we were going to enjoy it. The guide stopped occasionally to give us details about the limited number of plants/flowers in the area -- we could not have cared less (the detail was questionable anyway) but it was an excuse for a break. We did taste the hallucinogenic berries he showed us, but not enough to have any effect! At times it did get sunny and we had to remove layers (I -Dan - had on just a t-shirt and the jacket). The last gasp of day 1 was the hardest. We crossed a river (thankful for the rubber boots) and started up a ridge. This was our first (but certainly not last!!) 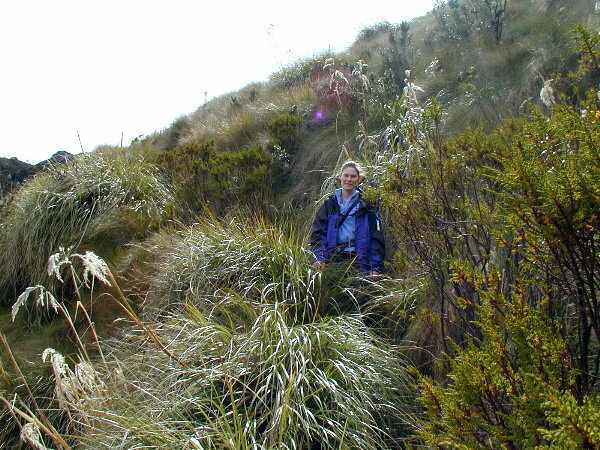 introduction to paramo grass, or the 'ankle breaker' plant. It looks good from a distance but as you walk through it you realize it is really unevenly spaced tight clumps of long grass. So as you step on a clump, your foot slides some direction between the clumps. The grass itself grew so high and thick that you could not see the ground. There also was not enough consistent space to walk between the clumps so you had to just try not to break your ankle. The steep ridge went on forever, but we finally made it to camp. The three horse keepers had already set up camp. Camp on day 1 was at an altitude of ~12000 feet. The cook made an amazing 3 course meal, and the guides and horse keepers ate an amazing amount of food. It was all outstanding, but it felt odd to be eating that way while camping! That first night introduced us to the chill of the Andes. We went to bed at 9:15PM (after dinner) since there was little to do with no light, and everybody but us spoke Spanish. It got down to 25°F and was quite windy. We slept very little because the ground was very hard, and it was difficult to stay warm. The tent had a sheet of ice/frost on it in the morning. Each day, the horse keepers break camp after we leave, then pass us somewhere along the hike, on their way to set up the next camp. Day 1 brought almost constant rain and 38°F. 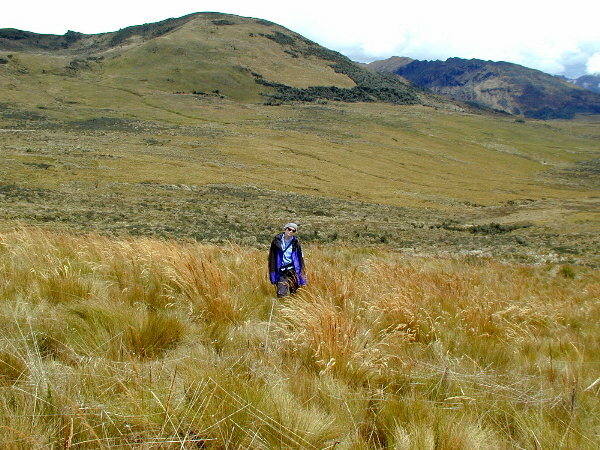 At the end of day 1, we were introduced to 'ankle breaking' paramo grass on the side of a long ridge (see detail text to left). 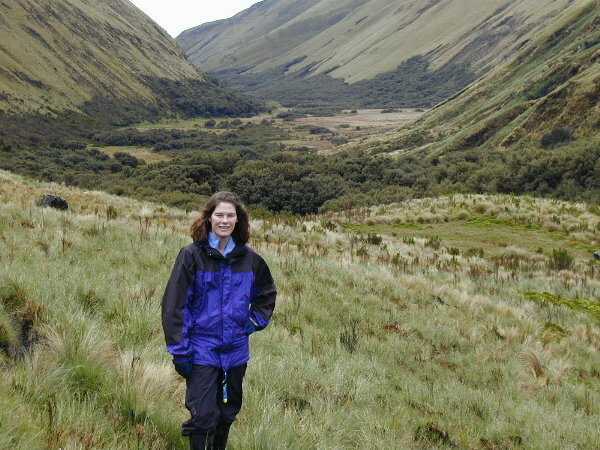 Kristen in the paramo grass. The first night it was 28°F with windy off/on rain. Dan is freezing at camp the next morning. Day 2 was extremely long and took us through tall grassy ridges with no defined trails. 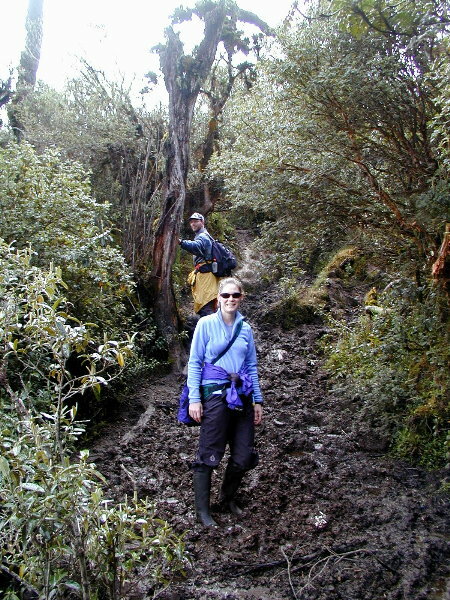 Under the growth was mud, running water/creeks, or just paramo ankle breaking grass. Kristen making her own trail. On day 2, we sumimtted many huge ridges. 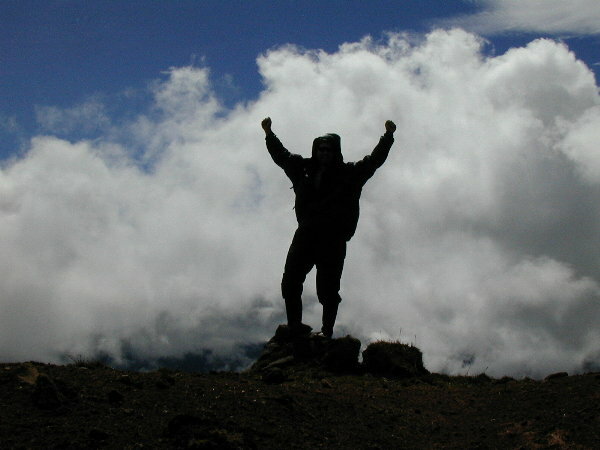 Dan is celebrating an especially large one (around 13K feet). We are both very frustrated with trail-less trekking. Kristen shows some disgust in the 7th hour of it. 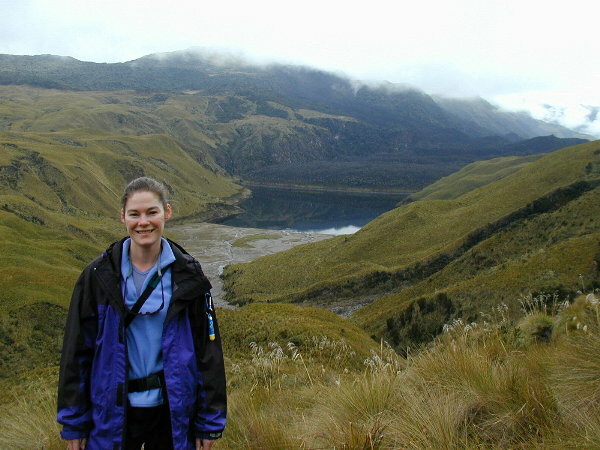 Kristen with Lagune de Volcan in the background -- our site for Day 2 camp . 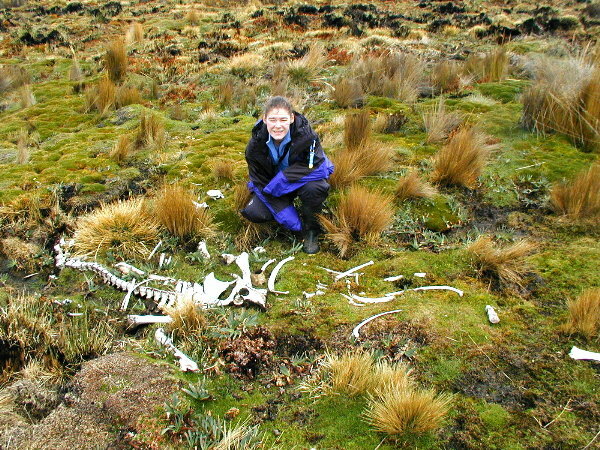 We saw many full animal skeletons at the higher altitudes. 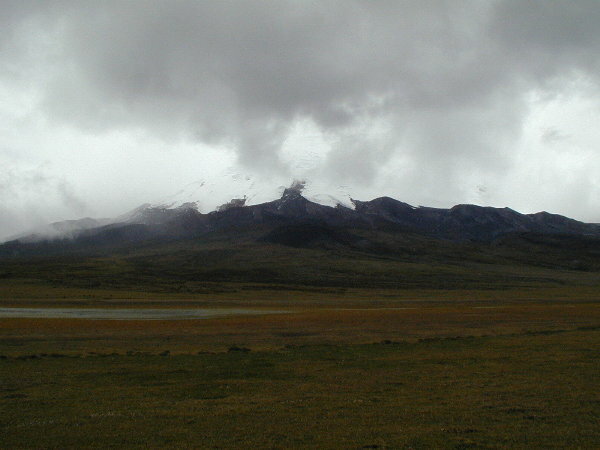 On day 3 there was finally a break in the clouds so we could see Mount Antisana, the 21K foot celebrated volcano. Day 3 started with constant uphill climb to 14K feet. Kristen stopping while on one of the many muddy trails. Day 3 camp in the bottom of gorge at 13,500 ft. The gorge was beautiful but VERY cold (24°F) and windy. 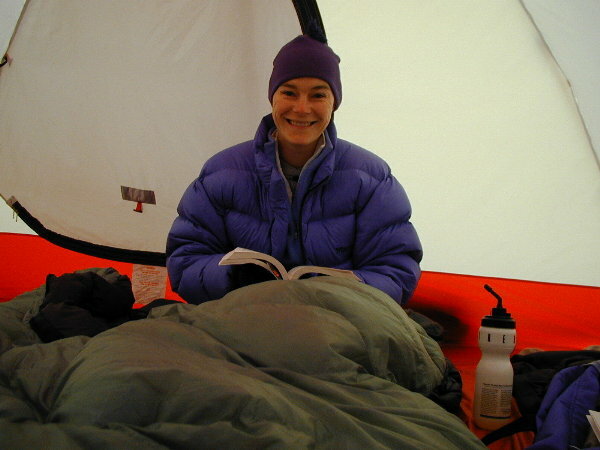 A candid shot of Kristen bundled up killing time in Day 3 camp. Day 4 was another off/on rainy day. We are rushing to the next camp hoping the guide is alive (see text to left). Our 'escape' on day 4. A friendly driver gives us a ride out of the Andes (see 'escape' in left). We got out of our tent at first light, around 6AM. Breakfast was another eating display -- hard boiled eggs, fruit, cereal, yogurt, all leftovers from the night before, etc. -- we did not eat much, but as usual the horse keepers finished whatever was left. At the very beginning of day 2, when our guides got out the maps, it became clear that this was new ground for all of us. The horse keepers knew the way to the next camp but our guides felt that there had to be a better way. 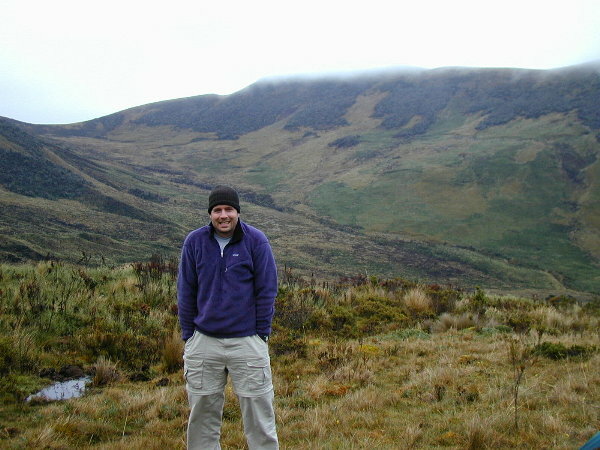 We ended up walking for 8+ hours on paramo grass (or worse) without any trails. At one point, we were extremely frustrated at the guides for taking us this route. 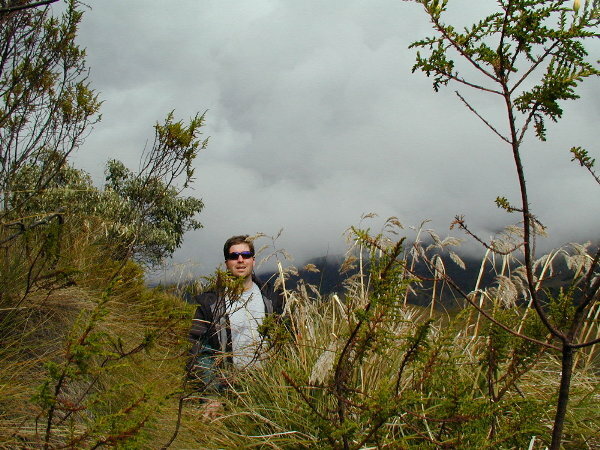 The route was either paramo grass, or larger growth that you could not see through with the sound of running water below (so on some steps you dropped 2 feet into a creek), or swamp land (if you did not stay on the large clumps of green, you sank 8 inches into mud/water). It is amazing that from a distance the land seems beautiful, but as you cross it, you realize it is all swamp land. 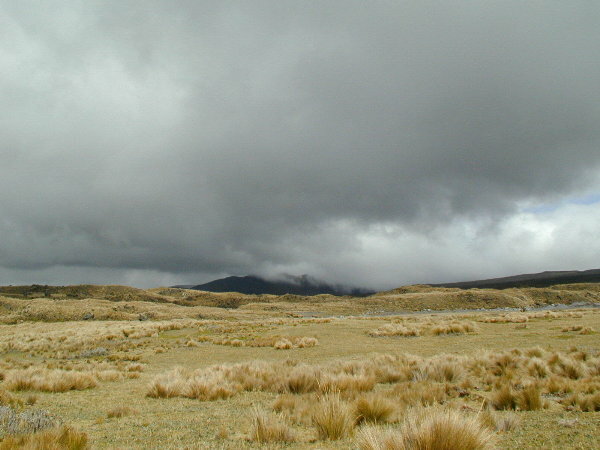 On the peak of each ridge, after having traveled as far as the eye could see, again, we sank in despair as we saw nothing but another ridge, more paramo grass and swamp land and no camp! We lunched at a spot in a cool stream where hot springs were flowing from the rock wall into the cold streams. Supposedly, the spring water is hot enough to boil an egg. I tested with my hand, and I would agree! After lunch, more swamp and paramo and long creek grass. The difficult terrain really took it out of our legs/knees, and we were concerned that we could not hike the next day. 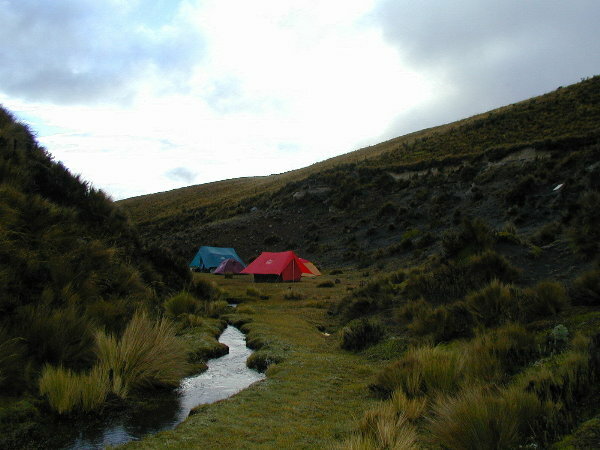 Fortunately, the camp was at a lower altitude (11,972 feet), so it was warmer and we slept fairly well. Camp at day 2 was in Laguna Volcan, or "Volcano Lagoon", which was beautiful. The horse keepers/cook caught trout in the river feeding the lake by stabbing them with newly found sticks -- pretty impressive. That night Henry, the extra guide, taught us the Ecuadorian card game 'quarente' ('forty' in English). It was lots of fun and we played it each night after dinner. The cook made another outstanding soup (great soups each night) and served spaghetti with meat sauce followed by pears in cinnamon water. The interesting twist on the spaghetti was that the meat sauce had no tomato base, but they served it with a bottle of ketchup to add the tomato base on your plate. Dan was quite pleased with this setup! And yes, they had even brought enough ketchup. We woke the morning of day 3 fairly well rested since we were so tired from the long hike on day 2 and had had so little sleep the night before. When we left the tent we were attacked by the one major insect at that altitude: sand flies. They look like flying gnats but they bite. There were hundreds all over the tent and they swarmed around you when you were in the open. The cook burned grass outside the eating tent during breakfast to keep them away. We were told to expect about as long a hike on day 3 as day 2, about 7+ hours with the first 2+ hours being mostly a hard climb up muddy trails. We ended up completing the steep climb part in 1 1/2 hours and the entire hike that day in 4 1/2 hours. Most of the last part of the climb was flat, but we were around 14,000 feet so the air was thin. It sleeted on us for the last hour of the hike. 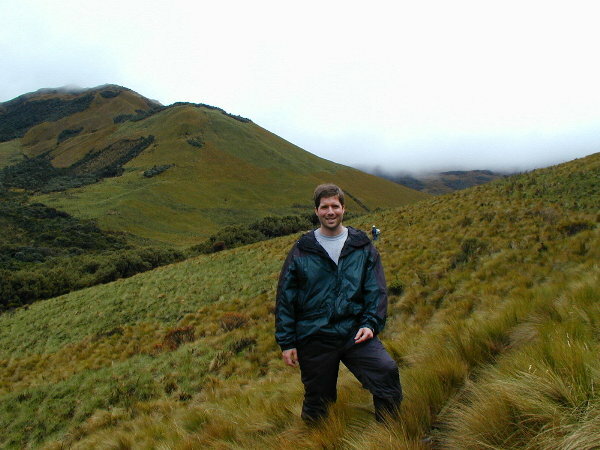 Since we were ahead of schedule, when we passed the Antisana mountain, Henry, the extra guide, decided to split off and look for new routes for future treks. He was to meet us at the camp by 6PM (before dark) and took one of the walkie-talkies just in case anything went wrong. We camped day 3 in a gorge that had a deep but narrow stream. It was beautiful but very cold since it was at 13,776 feet. Henry did not show up at dinner and could not be raised on the walki-talkie. Since it was dark we all were worried. We loaned Bram (our head guide) and the horsekeepers our headlamps so they could go look for Henry -- amazing that none of them had flashlights! They came back about an hour later and were sure that they had found Henry's footprints in the sand and guessed that he had gone past the camp and to the 'hacienda' (the landowner's house) which was about an hour past our camp. We could not explain why we could not raise him on the walki-talkie or why he would not have just come to camp. We figured that if he were at the hacienda he would leave at first light and be at our camp by breakfast. We were all pretty worried. That 3rd night was the worst night of them all. It was very cold at that high of an altitude so we had to wear pretty much everything we had to bed (not for the claustrophobic!) Dan had had a hard time getting a full breath from the moment we arrived in Quito (8 days earlier), but we figured it was just the high altitude. Well, on this night he could not get to sleep because every time he laid back and started falling to sleep his body would jerk him awake, lacking oxygen. It was so difficult to breathe lying down that the had to sit up all night waiting for the morning (See Worst Medical Crisis). On the night of day 3, Kristen got little sleep and Dan got pretty much no sleep. And we woke up worried about Henry. By 7:30 in the morning Henry had not shown up, so we were pretty concerned about Henry possibly being dead on Antisana. Given that concern and given that it was another cold rainy day, we cut our day 4 hike short to be just a direct 3 hour hike to the next camp, Lake Mica, so that Bram could search for Henry. When we found Bram mid- way to the next camp, he said that Henry was fine and that Henry had gone on to the next camp -- we were pretty frustrated at this point and saw no reason to sit at the next camp all day, in the rain and cold, and camp another cold rainy night just to be picked up at 8AM the next morning. So Dan told Bram that we wanted to get home today. Bram said that there was no phone at the next camp, we were 2 hours from Quito, and there was no way to get a car out there before 8AM the next morning. Dan let Bram know he was serious, and that the lost guide situation had ruined our day and he needed to do what he could to get us out early. We had Alfredo (the cook) go get Henry at the next camp, the horse keepers led us to the ' hacienda', and Bram walked to the closest phone at the end of the next valley (as far as the eye could see). 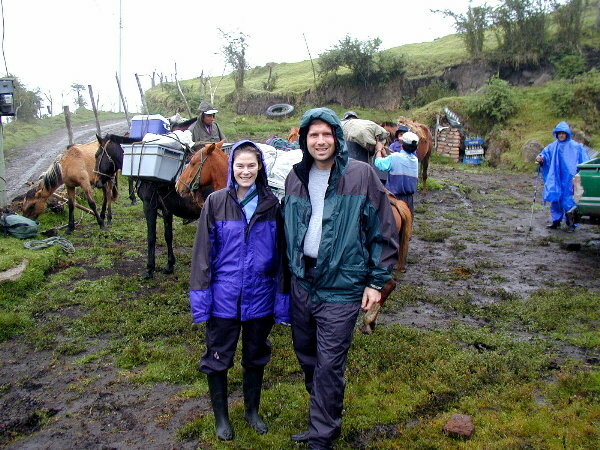 We got to the hacienda and the horse keepers set up the kitchen tent and left to go home with the 5 horses. We waited at the hacienda in the rain and 30 mph wind, until Bram got back. He said there was a phone at the house at the end of the valley, but that it had not been working for 15 days -- he confirmed it with another trekker he saw along the way. He said that we would have to wait for the cars the next morning, and of course they would not know where to go since we could not call them and tell them we were at the hacienda, not Lake Mica. So, we would have to hike back to Lake Mica in the morning before 8AM. When Elias, the head horse keeper, saw our frustration as we were shaking from the cold, anticipating the cold windy night, he said maybe there was another option. He said that occasionally cars traveled along a road a mile from the hacienda, and maybe we could hitch a ride with one of them (if they would stop). So Bram and Elias hiked to the road while we waited in the tent -- Dan told Bram to offer whoever stopped any amount of money necessary to get a ride (our $ threshold was pretty high given the weather and the idea of sleeping in a hotel vs. the tent). He came back an hour later with a car that was heading to Pintag, a town not far from Quito, and we could probably find a way from Pintag to Quito. Since no one spoke English and Elias also wanted to get home, Elias joined us with the nice travelers with the car. They dropped us on a street corner in Pintag, and asked for $3 (what a bargain!). We hailed a cab, and Elias said the driver wanted $7 to get us back to the Hilton in Quito (what a bargain!). We made it back to the hotel and gave Elias $15 to get a taxi back to his home town -- he was thrilled since it was likely far more than the ride would cost, but we were heading to a warm shower and a bed so we didn't care if it was "excessive"! We enjoyed that extra night in the Hilton Quito Colon with a 2 for 1 special from Domino's Pizza and watched HBO/Cinemax until late. Much better than our rainy, windy, cold alternative! Trekking group we used in Quito. No comment. Atlanta based travel agent who set this up. Not the best at returning email/vmail..